New Winter 2018: The purity of love is celebrated in this beautifully designed Christmas keepsake that will be cherished forever! 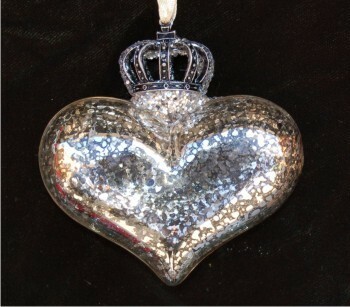 The crowned heart silver reflections Christmas ornament is made by hand from quality glass and finished with premium lacquer to produce a gleaming finish. The crown on top reminds the recipient that your love for them is strong and loyal. These make great ornaments for girls, moms, sweethearts or friends. Share a loving moment with someone close to you with the silver heart and crown glass Christmas ornament that arrives in a plush velvet gift pouch ready to display wherever it brings the most happiness. Granddaughter's Christmas Ornament Oct 17, 2017 Jeannie T.
Nice price for customized glass Nov 16, 2014 Farhanna P.